Over 10% of UK foreign aid for projects with a climate change component was channelled through 79 private consultancies, or more than £875 million since 2011. Analysis of Department for International Development (Dfid) data by Climate Home News found 77% of that went to just five large British or Dutch firms – Adam Smith International (ASI), KPMG, PricewaterhouseCoopers (PwC), IMC Worldwide and Crown Agents. A large part of the UK’s international climate finance programme between April 2011 and June 2018 was administered by Dfid. The department spent £8.4 billion on 251 projects in that time. In response to questions, Dfid told CHN that £3.9bn was spent specifically on efforts to address climate change, with £472m, 12% of the total, spent through consulting firms. The stated purpose of the programme is to support international poverty reduction by helping developing countries adapt to climate change. Most is disbursed by aid and non-governmental organisations, such as the UN, Oxfam and the World Health Organization. 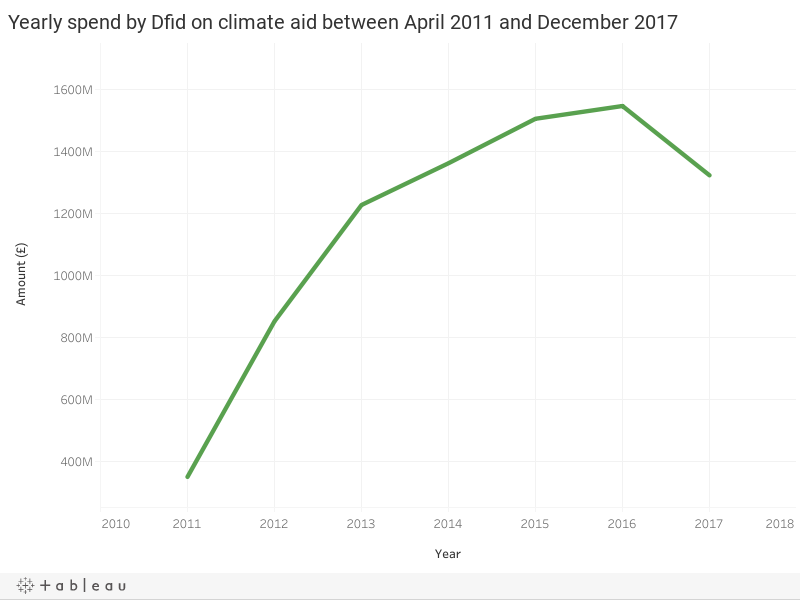 CHN drew its data from transactions listed on Dfid’s development tracker webpage, the UK’s aid spend on climate was previously mapped by Carbon Brief. Experts said the reliance on consultants had grown due to Conservative government public spending cuts and raised concerns about “recycling” aid money back into rich countries and undermining the development of expertise in poor countries. Dfid does not publish how much UK aid money the companies retain as fees for their services. Neither the department, nor any consultancies, would share this information with CHN. An ex-Deloitte consultant told CHN a consultant typically charges between £500 and £1,500 a day. “They wouldn’t do it if there wasn’t a profit to be made,” they said. 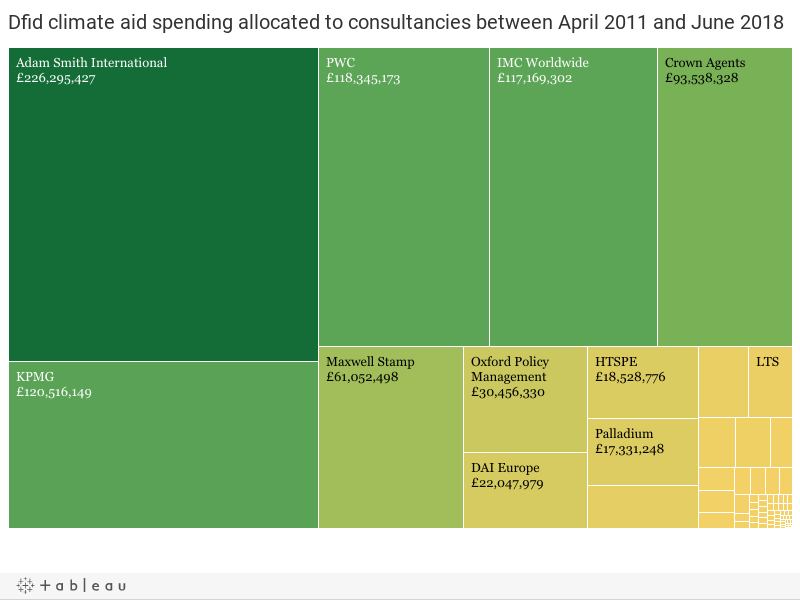 Deloitte has received £236,633 from Dfid since April 2011. The figure for the day rate was backed up by another industry source. In 2012 evidence to the select committee on international development, ASI said the day rates it charged Dfid were “generally in the £400 to £850 range, with only a few outliers”. Dfid uses aid contractors because they “play an important role in development work when they deliver well. They provide specialist expertise, flexibility and deliver UK aid’s life-changing work in some of the most fragile and dangerous places in the world,” a department spokesperson said. But when money is spent on western consultants, it keeps it out of the country in need, said Saleemul Huq, a senior climate change fellow at the International Institute for Environment and Development. Joe Thwaites, at the World Resources Institute’s Sustainable Finance Center, said on-the-ground ownership led to better results. “A lot of the literature on aid effectiveness recognizes that development projects are more likely to be successful if there is local ownership, and this includes hiring local staff,” he told CHN. “Direct access can help build up the capacity of local institutions to design and implement their own projects, drawing on local knowledge and expertise to tailor solutions to the specific needs of the community in question,” Thwaites added. Frank Rijsberman, director general of the Global Green Growth Institute (GGGI) said that globally there was a strong trend away from using western consultants. Experts working for their own governments were “much more credible”, he said. The role of consultants in UK climate aid reflects a wider trend of austerity-driven public spending, according to Rijsberman. “Under David Cameron, there was growth of the development budget, but stoppage on the number of staff. Meaning Dfid is lean and mean, but the work still has to be done and it tends to be done by others,” said Rijsberman. All donor countries used consultants to deliver projects, he said, but because of the UK government’s push to cut public sector jobs, Dfid had “very few in-house technical experts”, leading it to rely on consultants “somewhat more than other aid agencies”. Dfid disputed this, saying the number of full time equivalent staff had grown since 2011. KPMG, IMC Worldwide, McKinsey and Deloitte all declined to comment on this story. ASI, received the most Dfid climate cash, more than £226 million. Alex Ephinstone, who directed the Climate Smart in Africa programme for ASI, said: “We do present a good value for money”, adding that the figure quoted by CHN “looked high”. Climate Home News has previously received Dfid funding for reporting projects in Africa and Asia. Those projects were administered by PwC consultants. A spokesperson for Crown Agents, which received £93.5m, said that the company had performed a banking service for Dfid. “If that figure is correct the vast majority of this money was for disbursement through Crown Agents Bank to other agencies. It would therefore not be accurate to compare this sum with sums of money spent on programmatic activities by other suppliers,” the said. In terms of actual project funding, they said, “I would say it is comfortably under £10 million”, adding “we are a not-for-profit organisation”. A former senior partner at McKinsey, a consultancy that received £108,135 from Dfid, told CHN climate change was a “top three urgent challenge to restructure the international economy” on which “the government should look to get the best possible advice”. In 2016, the Times of London accused Dfid of lacking the systems to properly assess the performance of consultants. Rijsberman’s GGGI receives Dfid funding to support a programme of in-country advisors who sit within government. He said: “I don’t know another aid agency that as carefully and as quantitatively goes through all the agreements and scores the performance of contractors.” He said the outcome of these checks was clearly linked to future funding. A spokesperson for Oxford Policy Management, which was contracted to deliver climate projects in South Asia, said Dfid had created a market with 200 service suppliers vying for contracts. “This competition drives costs down, and increases innovation and value for money,” they said. But developing country governments question the way value for money is assessed. Gebru Jember Endalew, an Ethiopian government official and chair of the Least Developed Countries (LDC) group, said recipient countries should be the ones to identify their needs and priorities. “[Using consultants] is not only a way of recycling finance; it also undermines the capacity development in poor countries,” said Chukwumerije Okereke, geography and environmental science professor at Reading University. Dfid and consultancies argue that some governments lack the expertise to deliver complex projects. Okereke said that claim had some grounds. But at the same time, he said, it “shows that decades of so-called concerted effort in capacity building has not worked”. The International Development Committee launched an inquiry into the effectiveness of UK aid in combating climate change in July, which is accepting evidence submissions until September. Findings are expected early next year. In October 2017, Carbon Brief mapped where UK foreign aid for climate change is spent after obtaining a list of 284 climate finance projects across Dfid (251), Defra (6), and Beis (27). Climate Home News only analysed data from the 251 Dfid projects. A full list of the 79 consultancies and the amount they have received since 2011 can be viewed on a read-only spreadsheet here. Note: This article was amended to reflect the fact that ASI were found not to have falsified testimony by a parliamentary committee, despite media reports the company called a “fabrication”. The piece also originally said ASI had profited from leaked internal documents, this has been removed. The article was also amended after Dfid returned to our requests with specific data on the proportion of funding specifically spent on addressing climate change, rather than projects with some element of climate change finance within their budget. We also added a line from Dfid refuting a characterisation of their staffing numbers as depleted.